planting will be in front of the far stone wall. A repeat of last week’s column. Volunteer responses have been weak, so if you or anyone you know wants to be involved in these efforts to improve Maynard’s outdoor spaces, now is the time. One key change – the bulb planning weekend has been shifted to October 20-21. So once again: Can you handle a brush saw? Know which end of a shovel goes into the ground? Not afraid of the outdoors? Then there are two – yes, two – volunteer opportunities waiting for you this fall: Trailkeepers and Trail of Flowers (TOF). planted with grass and daffodils. As to “Trail of Flowers,” now that the Assabet River Rail Trail is paved in Acton and Maynard, a proposal has been made to embellish the trail with extensive plantings of spring-blooming bulbs. The proposer is David Mark (me). Briefly, donations have been made to pay for the purchase of bulbs. In November, volunteers will be asked to commit to showing up for day or two, tentatively mornings of October 20 and 21, to plant bulbs. It will be BYOS, as in bring-your-own-shovel. If this gets off to a good start this fall, with an impressive blooming next March and April, the project will become an annual effort. 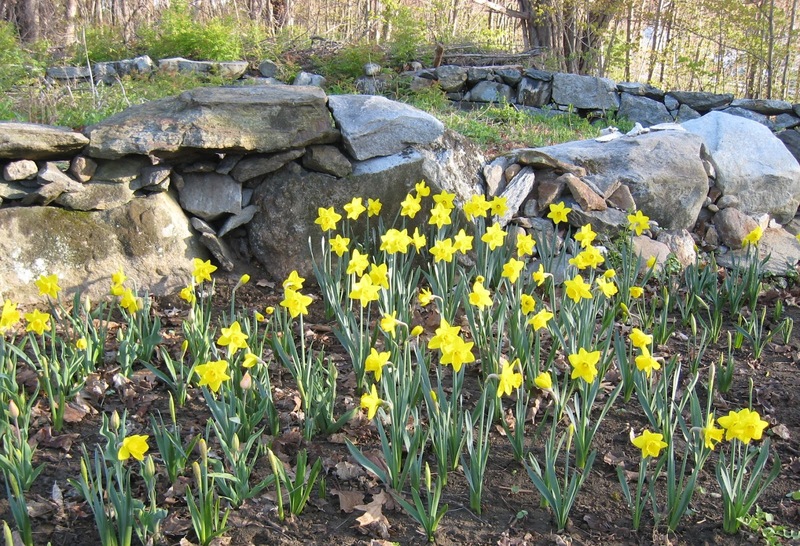 A couple of hundred daffodils were planted at the Marble Farm site in 2009.
became overgrown with Oriental bittersweet. Click on photo to enlarge. For this kick-off year the plan is to plant 1500 daffodils at the Marble Farm historic site, which is at Maynard’s north end of the trail, across from Christmas Motors. In addition, flyers will be delivered to the homes of people who are trail abutters, suggesting they plant bulbs and other flowers on the trailsides of their own properties. Bulbs will be provided to them. For future years, other sites in Maynard (and possibly in Acton) will be mass-planted with bulbs and other perennial flowers. Each spring there will be an organized flower-viewing trail walk, with suggestions to wear flower-themed clothing (Hawaiian shirts, anyone?). And a flower poster to promote the event and list sponsors. And a website. The 2019 walk will start at the footbridge over the Assabet River, pass by Tulip Corner (intersection of Summer, Maple and Brooks Streets), then proceed north on the Rail Trail to Marble Farm. On Saturday, October 20, volunteers planted approximately 900 daffodils at the Marble Farm site. Remaining bulbs to be planted elsewhere along the Trail.